Commander Job W. Price should be given the Medal of Honor!!! If Obama and Hillary are going to tell a lie, lie to make the military look good. Don't trash the career of an American Hero. Commander Job W. Price fought and died for America. He is another casualty of the Clinton Body Count! They made a joke but the military didn't laugh. They leaked false information to the Associated Press about a suicide. Now the record needs to be set straight. Commander Job W. Price, you are not forgotten!!!! Commander Job W. Price was involved in a plane crash in Iran with Secretary of State Hillary Clinton. He was killed as a result of injuries he sustained in that crash. There is ample evidence that this did, in fact, occur including a Hillary Clinton email released by Wikileaks. 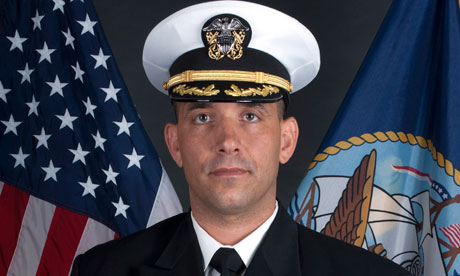 The government covered-up this death by leaking through an anonymous source to the Associated Press that Commander Price was killed by a wound from an apparent suicide. They trashed an American Hero to cover-up dirty deeds. Commander Job W. Price should receive the Medal of Honor for his valor in protecting Secretary of State Hillary Clinton when he flew into Iran, a hostile country for any American Military Man especially a decorated Navy Seal who twice was awarded the Bronze Star. December 11, 2011 - DEBKA reports that Iran is driving a hard bargain for access to the US stealth drone RQ-170 it captured undamaged last week. Russian and Chinese military teams arrived for a look at the secret aircraft. September 2012 - Obama reaches out to Ayatollah Ali Khamenei "offering an important concession for helping Obama win the election in November." DEBKA-Net-Weekly Vol. 12 Issue 562, October 26, 2012. December 1, 2012 - Debkafile reports that "Obama Administration Officials and senior representatives of Ayatollah Ali Khamenei launched secret talks on Iran's Nuclear Program." December 1 - 7, 2012 - Israeli Intelligence pegs this as range of dates for plane crash in Iraq. They cite the incident as occurring the first week of December, 2012. According to the report Clinton was flying in a C-12 Huron. The plane landed in Avaz, Iran at Ahwaz International Airport. President Ahmadinejad landed at the airport just minutes prior to the landing of the Huron on an unscheduled visit. Since neither US or Iranian warplanes were scrambled it is clear that this was a (wink wink) "scheduled visit." Incursions by US Planes into Iranian airspace are not taken lightly. "According to US Military flight logs, recorded by Russian air and space forces confirm that Commander Price, and other members of US Navy Seal Team 4, left their base in Uruzgan Province, Afghanistan on a flight to US Naval Support Activity Bahrain where they met with Secretary Clinton and all of them transferred to the C-12 Huron that began a flight path to Baghdad, Iraq." DEBKA reports, ""Although our sources have not identified the negotiators on either side of the table, one of the theories floating around certain capitals claimed that Hillary Clinton three weeks ago was on her way to a secret meeting with President Mahmoud Ahmadinejad in regard to those negotiations. The plane carrying her from Bahrain logged its destination as Baghdad, but is described as having changed direction in midair and headed for Ahvaz, capital of the south Iranian province of Khuzestan. There, it was said, the Iranian president was awaiting her arrival. But then the plane ran into technical trouble and made an emergency landing and that was when she was injured, according to this theory. The unexplained death of Commander Job Price, 42, SEALs commander in Afghanistan is [also] tied by some of the speculation to that incident." Iranian television also confirmed the plane crash with sketchy details. December 6th 2012 – Hillary Clinton cancels friends of Syrian Forum saying she has the flu. This could have been a political move to dodge a group not aligned with Iran, setting the stage for the meeting in Iran. December 7 – According to official Department of State log, “Secretary Clinton is on foreign travel to Belfast, Northern Ireland. 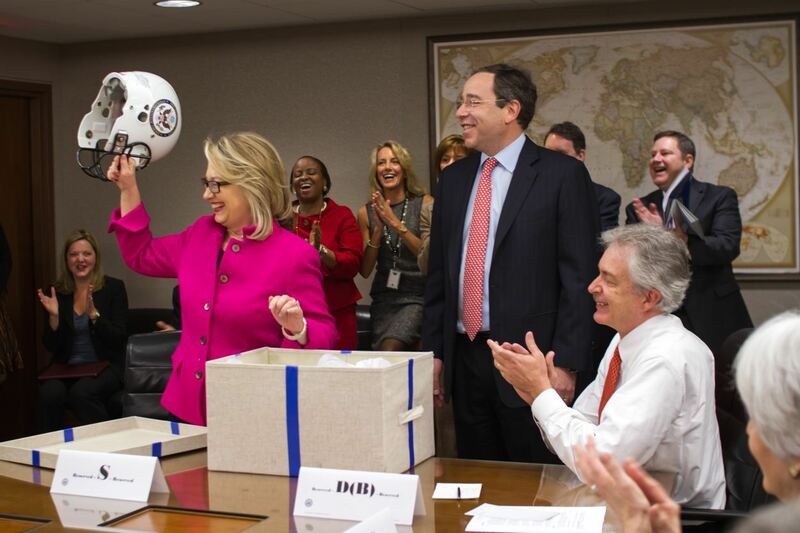 Secretary Clinton is accompanied by Assistant Secretary Gordon, Assistant Secretary Posner, Ambassador Verveer, Special Representative Balderston, Spokesperson Nuland, Director Sullivan, Senior Director for European Affairs Liz Sherwood Randall, and VADM Harry B. Harris, Jr., JCS. This was her last public appearance before her concussion. It is interesting to note that Ahmadinejad met with Ireland's new ambassador to Iran very soon afterward. Was Ireland facilitating the meeting? December 8th, 2012 - My best guess from all of the intel I have examined as the date of the crash. Clinton was seen in public on the 7th and she could have flown directly from Ireland to the Middle East. On the 9th there are already reports about Clinton's illness. December 9th – Hillary Clinton is said to have a stomach bug. December 10 – State department announces that Hillary Clinton has sustained a concussion after fainting due to dehydration earlier in the week and will be unable to testify at Benghazi hearing. "She has been recovering at home and will continue to be monitored regularly by her doctors. At their recommendation, she will continue to work from home next week, staying in regular contact with Department and other officials." - State Department Release. December 11, 2012 – Hillary Clinton is unable to testify on Benghazi hearing in Congress. December 21 – Rumors intensify that Clinton was involved in a plane crash in Iran. Obama nominates Senator John Kerry to replace Hillary Clinton as Secretary of State. December 28, 2012 - Mainstream media reports that Clinton will be returning to work this week after suffering a bout of the flu and a concussion, but Clinton does not return to work. December 29, 2012 when a follow-up exam for her concussion found she had a blood clot of her right transverse venous sinus. December 31, 2012 - Hillary Clinton is admitted to the New York Presbyterian Hospital with a blood clot caused by a concussion. The hospital reported that Clinton was being treated with anticoagulants and her condition would be assessed in 48 hours. NBC's Robert Bazell reported, "Either it's not really related to the concussion and she's got a blood clot in her leg or something, or there's something else going on that we're not being told." Chelsea Clinton leaves the hospital visibly distraught. December 31, 2012 - DEBKA, Mossad linked news outlet, publishes article, "Hillary Clinton in Hospital Amid Speculation of Plane Accident in Iran. "A new report by Israeli media and Mossad now FULLY CONFIRMS THIS REPORT, Hillary Clinton was indeed injured in Iran, the new report also shows that Obama has already named the new US Secretary of State: John Kerry, Obama Warned To Prepare For Hillary Clinton Death." February 6th, 2013 - Press briefing of Jen Psaki. The tape is altered. 8 minutes is missing on the posted video tape. Someone has been told to bury the deleted tape and to replace it with a flash. December 2, 2013 - at a State Department press briefing Victoria Nuland is asked if we were in secret negotiations with Iran. She categorically denies this. May 9, 2016 – Fox News contacts the State Department to ask about missing video from February 6, 2013 in the State Department Press Briefing. QUESTION: Please, Jen, can we stay on Iran, please? MS. PSAKI: Sure. Let’s stay on Iran and then we can go to China. QUESTION: -- about Iran. And with your indulgence, I will read it in its entirety for the purpose of the record and so you can respond to it. That’s the entirety of the exchange. As we now know, senior state department officials had, in fact, been conducting direct, secret bilateral talks with senior officials of the Iranian Government in Oman, perhaps dating back to 2011 by that point. So the question today is a simple one: When the briefer was asked about those talks and flatly denied them from the podium, that was untrue, correct? MS. PSAKI: I mean, James, I – that – you’re talking about a February briefing, so 10 months ago. I don’t think we’ve outlined or confirmed contacts or specifics beyond a March meeting. I’m not going to confirm others beyond that at this point. So I don’t know that I have any more for you. QUESTION: Do you stand by the accuracy of what Ms. Nuland told me, that there had been no government-to-government contacts, no secret direct bilateral talks with Iran as of the date of that briefing, February 6th? Do you stand by the accuracy of that? MS. PSAKI: James, I have no new information for you today on the timing of when there were any discussions with any Iranian officials. QUESTION: -- and I appreciate your indulgence. QUESTION: Is it the policy of the State Department, where the preservation or the secrecy of secret negotiations is concerned, to lie in order to achieve that goal? MS. PSAKI: James, I think there are times where diplomacy needs privacy in order to progress. This is a good example of that. Obviously, we have made clear and laid out a number of details in recent weeks about discussions and about a bilateral channel that fed into the P5+1 negotiations, and we’ve answered questions on it, we’ve confirmed details. We’re happy to continue to do that, but clearly, this was an important component leading up to the agreement that was reached a week ago. QUESTION: Since you, standing at that podium last week, did confirm that there were such talks, at least as far back as March of this year, I don’t see what would prohibit you from addressing directly this question: Were there secret direct bilateral talks between the United States and Iranian officials in 2011? MS. PSAKI: I don’t have anything more for you today. We’ve long had ways to speak with the Iranians through a range of channels, some of which you talked – you mentioned, but I don’t have any other specifics for you today. QUESTION: One more on Iran? QUESTION: The Los Angeles Times and Politico have reported that those talks were held as far back as 2011. Were those reports inaccurate? MS. PSAKI: I’m not sure which reports you’re talking about. Are you talking about visits that the Secretary and others made to Oman, or are you talking about other reports? QUESTION: I’m talking about U.S. officials meeting directly and secretly with Iranian officials in Oman as far back as 2011. The Los Angeles Times and Politico have reported those meetings. Were those reports inaccurate? MS. PSAKI: I have nothing more for you on it, James, today. MS. PSAKI: On Iran? Let’s just finish Iran and then we can go to China. Go ahead, Roz. QUESTION: One of – one more on Iran. Foreign Minister Zarif said, directly contradicting the Obama Administration’s contention that sanctions worked, he told our interviewer that when the sanctions were first imposed, Iran had 200 working centrifuges. Today, they have more than 19,000. What is this building’s reaction to his comment that sanctions did not work and did not bring Iran to the negotiating table? MS. PSAKI: Well, again, I would like to look more closely at the context of the comments. But, just as reminder, President Rouhani and others have talked about how the impact – how growing the economy and putting an end – doing – bringing an end to the sanctions is something that was a priority for them in order to help the economy and the Iranian people. There’s no question, if you look just at the facts of the impact of oil revenues, the impact on their economic growth writ large that there was a huge impact of – that there – the sanctions had an enormous impact, and that that was a driving factor in bringing the Iranians back to the negotiating table. In terms of progress made on their efforts to develop a nuclear weapon, whether through centrifuges or at their various facilities, that to me sounds like a separate question. Obviously, there was concerns about steps they were taking and progress they were making, which was why it was so important to come to an acceptable agreement that would halt and roll back the progress of their program. QUESTION: -- Secretary Kerry, when he did his round robin of interviews after the announcement of the deal in Geneva, more than once stated that when Iran had reached out to the Bush-Cheney Administration in 2003, Iran was only in possession of 164 centrifuges. Now, he would go on to say, they have 19,000, and this therefore represents the best possible deal that could be secured. Isn’t it a fact that since the Obama-Biden Administration took office, 70 percent of Iran’s centrifuges have been installed? MS. PSAKI: Well, I’d have to look at the statistics, James, but we have not questioned the fact that Iran has made progress on enrichment and on developing a nuclear weapon. We have not questioned that. That’s one of the reasons why we stepped up sanctions over the past couple of years. The President and Secretary Kerry were big proponents of that. We worked with the international community to do just that to put that necessary pressure in place. QUESTION: Right. I’m pursuing the separate one part that she carved out, and that is to say – and if this is untrue, I’d be grateful to be disabused of the notion – but the great bulk of Iran’s progress in the development of its enrichment program has taken place under President Obama’s watch, correct? MS. PSAKI: But they were being paired together, so that’s why I’m bringing it into the conversation. MS. PSAKI: Well, we will take a close look at his comments and we’ll have more to say about them once we do. © 2016 AmericanNewsService.org. All Rights Reserved.